Glenshee Walk, Shee Walk, Cateran Trail, Spittal, Coire Lairige, Enochdhu Estate, Allt Carra-lairige. A section of the recently opened Cateran Trail provides the return leg for this long and fairly tough circuit which sets out over a trio of low and rarely walked hills on the west side of Glen Shee. The starting point is that Mecca for skiers and wrinkly coach parties, Spittal of Glenshee. Set off through a kissing gate next to the road bridge over the burn just west of the Spittal of Glenshee Hotel, following signs for the right of way to Enochdhu and the Cateran Trail. A good path passes below a cottage on the right and climbs up alongside the stream to a gate and broken down stile higher up. Beyond this, the way rises into Coire Lairige, moving away from the burn and ascending towards a track obvious on the hillside to the right up ahead. Follow this up to reach the col at An Lairig. Just short of a gate leading into the Enochdhu Estate, turn left on to an obvious path that rises up on to the broad ridge. 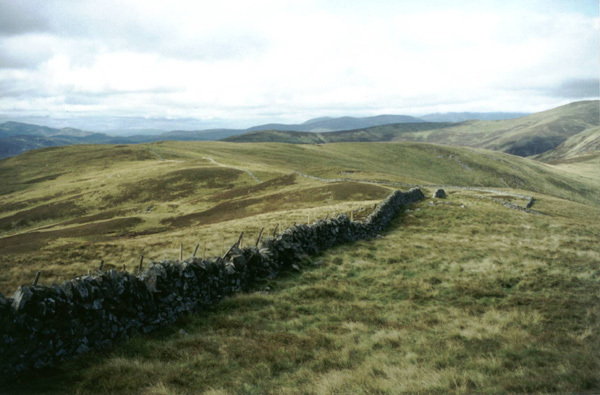 Stay relatively close to the boundary fence as it curves left along the crest, crossing through a gap in a drystane wall further on. The route dips before beginning the ascent of Meall Uaine proper. A first, lower, top is reached and, a short way south, the summit, marked by a cairn. This high point offers exceptional views in all directions, provided, of course, the weather is good. Carry on south from here, passing through a gap in a taller stone wall. You can stay faithful to the ridge, which veers south-west at this point, or just cut south into the col between Meall Uaine and Meall Odhar, the second top of the day and an easy climb. It is then possible to descend over Meall Easganan into the valley below to join the Allt Carra-lairige but the terrain down there is largely heather and marshy grass, which makes for tough walking. Instead, a good idea is to drop south into the col between Meall Easganan and Lamh Dearg and climb on to this final top. 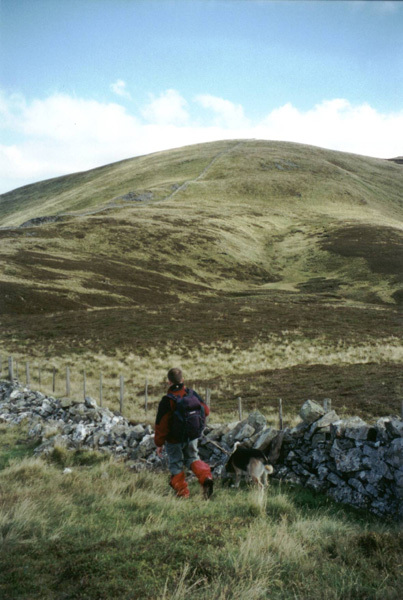 From there, descend south-east to join the right of way between Kirkmichael and Lair. When you reach the path, turn left and follow it east to the A93 at Lair. Cross the main road and follow the single-track B951 over the Shee Water to the tiny hamlet of Cray. Stay with the road as it climbs away from the cluster of dwellings and, a quarter of a mile on, turn left, following a track leading to Dalnaglar Castle. A Cateran Trail signpost at the junction indicating this as the route to Spittal of Glenshee will keep you right. Hemmed in by dense mixed woodland on the right, the track leads to the white-washed castle's main entrance where it forks. Take the right-hand option and continue through the forest, skirting above the castle grounds. Further on, the main track curves off to the left, to enter the estate. Don't take this, but carry straight on along a slightly overgrown track, which descends to the river and emerges from the trees, just beyond a stile, on the edge of an open, grassy field. Bear right at this point, following a grassy track running along the edge of the field. It stays close to the woodland on your right. At the far side of the field, a stile is reached. Cross this. Here the route of the Cateran Trail becomes a little unclear. When we visited, the knoll immediately ahead of us was planted with a root crop, so we skirted to the right, walking around the edge of this. On the other side of the knoll, a fence is reached. We followed this a short way west to what was effectively a wide opened in the fence next to a tree, then skirted to the right, round another field of crops. At the north end of this, a copse of trees is reached, and another post and wire fence. Follow the fence a short distance west to reach a gate and track. The track heads east before curving left, then runs along the edge of a fenced field to reach buildings at Dunmay. Follow the track north from here to Broughdearg where the route passes between farm sheds in the right and a house. It emerges into an open field of grass beyond. Once again there is not really sufficient in the way of markers to keep you on the Cateran Trail. We climbed to a ladder stile below a mast, only to be directed back down across the field. To avoid this, head north across the field, following vague tyre tracks in the grass. Pick up a fence and it leads to a wooden footbridge over the Allt Mor. Cross and carry straight on, a grassy track rising into the next field. Skirt right along the top edge of the field and a couple of stiles are crossed. When you enter the final field, which has a house up in the top right corner, bear left down a muddy path to join a solid farm track below Invereddie. Once on this, turn right and follow the track up towards the farm buildings. Skirt left when the sheds are reached and continue up to a lone house. Carry on up, along the front of the house, to a gate above it and go through. From here, an obvious path runs out across open moorland dotted with rocks and boulders and home to seemingly endless numbers of rabbits. It rises gently before curving left and descending to meet a gravel track running at right angles. Cross this and descend straight on over an open field to a gate at the bottom. Go through and a track bears left and then right, leading to Westerton of Runavey. A track heads west from the farm, leading to open grazing fields. Head for a ruined cluster of buildings in the middle of the field, then follow a fence up to the top right-hand corner of the field. Climb from here alongside a stone wall to reach a ladder stile in a high fence above. Go over this and follow the fence north across rough ground to reach another ladder stile and gate. Cross this and walk down past a steading on the left to reach a good track. Turn right and follow the track to reach the A93 at another stile. Walk left for a short distance on the wide grassy verge, then cross the main road and follow a minor road into Spittal of Glenshee. Exhausted from what turned out to be a more arduous trek than we'd originally planned, we rounded things off with a couple of pints and an excellent meal in the Spittal of Glenshee Hotel which offers a fine menu where repeat visits to the all-day buffet are positively encouraged! Map OS Landranger 1:50,000 sheet 43. Parking Free parking next to Cairdsport shop. Use the left-hand end of the bay to avoid taking spaces used by the shop. Grading A long walk over fairly rough terrain with paths and tracks in places, but not throughout. The return leg is along part of the Cateran Trail and although there are a fair number of waymarkers, the route on the ground is by no means clear in places, particularly where it crosses fields. Follow the instructions above and you should have no major problems. Dogs will need to go on the lead in places due to animal grazing.